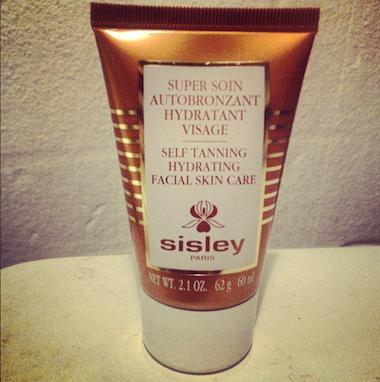 The Sisley Facial Tanner. Warning: You Will Want. Let’s get this out of the way; you know it’s not going to be cheap. It’s Sisley, for crying out loud! If you know you’ll fall in love with this yet money is tight, there’s a button at the top of this post that will take you to the next or last post. Avert your eyes! Minimise the browser window! Do not read on! For those with willpower/treat money/expensive tastes, listen up: I’m pretty sure that this is the nicest facial tanner that I have ever used. I’m not into straight-out tans, I prefer the safety of the graduals, but this one is pretty foolproof. You just need a tiny bit of the gel-cream to tan your whole face, it spreads and blends in very easily. I applied mine a little haphazardly, the first time, but thankfully it turned out well. You might want to take a little more care with your application – there’s no guide colour so just make sure you don’t miss any areas. If you just apply it like your regular moisturiser, though, you should be fine! What else? Texture, hydrating properties of the product: both excellent. If there was a version of this product without tan then I would most definitely use it a few times a week as a light, hydrating night cream. It’s perfect for combination or oilier skins because it’s not heavy in the slightest – it doesn’t have any kind of sticky finish either. This feels like a premium moisturiser with the added benefit of being a self-tanner – the scent is fresh and fruity and there’s no trace of biscuit/potato/pork whatsoever. Cons. Price? That’s always going to be a sticking point with Sisley, but they do make beautiful products. I regularly hate them for it, but I also thank them because there are quite a few areas of beauty in which they are simply the best, no contest. Have a read of my reviews for the Express Face Mask and the Black Rose Mask – read the first one if only for a quick laugh at the photograph. Sisley Self Tanning Hydrating Facial Skin Care is £78 for 60ml (not quite as expensive price per ml as, say, Lancome’s Genefique or other premium treatments, so you do have to put it in perspective!) and it’s available at House of Fraser or John Lewis, Selfridges and Harrods.